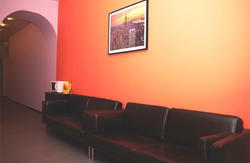 Hostel by backpackers for backpackers! Our stunning new hostel MIR (opened on the 30th of June) suits all kinds of travellers - stay with friends in the dorm rooms For ten or eight or twin and double, some of which have an en-suite bathroom! Have a romantic view at the roofs of the city, start your day with a cup of coffee and breakfast with surprise dishes at weekend. Our friendly team is young, but experienced in both travelling all around the world and welcoming friends in St.Petersburg! 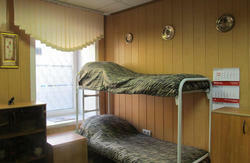 And we would like to provide the insider tips, off-the-tourist track sights and places locals go to. From Pulkovo-II (international flights): Take taxibus K-3 to 'Sadovaya' metro station and go by metro to the 'Admiralteyskaya' station (blue line). From the metro you walk 5 min - just turn round the corner, there McDonald's is and you will see the big street in front of you - Nevsky prospekt, just go to the crossroads and the house in front of you is Nevsky 16. From Pulkovo-I (domestic flight): Take bus 39 or taxibus K-39 to 'Moskovskaya' metro station and go by metro to the 'Nevsky prospekt' station (blue line). From the metro you can walk or alternatively take a bus (3, 7, 27) or trolleybus (1, 5, 10, 22) and get out at the second stop 'Bolshaja Morskaja uliza'. Go along the canal to the left from the CS, cross Ligovsky prospekt and you see the metro station 'Obvodny Kanal', take direct line to 'Admiralteyskaya'.